1909. 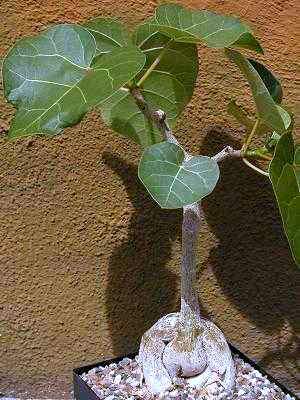 By mistake: Ficus abutifolia? This member of the Moraceae family was given this name by Friedrich Anton Wilhelm Miquel in 1867. It is found in two populations in Tanzania, Mozambique, Zimbabwe, eastern Botswana, Swaziland and South Africa. It grows on bare rocks, in grit and other well drained soil. The stem can grow to 70 centimetres in diameter, the tree reaches six to fifteen meters height. The flowers are green with a pink centre.